Envisioned as both a live performance and broadcast venue, Allied Esports International began drafting plans for a dual-purpose facility at the iconic Luxor hotel pyramid on the Las Vegas strip in mid-2017. It was to be a premium environment for gaming, where teams would face each other in league play before a live audience with multiple cameras and audio sources serving large displays and a front-of-house audio system in real time. In addition, Esports wanted the capability to produce, package, and distribute events with broadcast quality production values — to be streamed in real time to audiences around the world through subscription-based services. As the chosen venue was formerly a nightclub designed to host DJs and music with full video and audio, the aim was to repurpose its existing A/V systems — but much of the infrastructure proved inadequate, lacking the connectivity and bandwidth for broadcast-style live sports. System Integrator CBT Systems was called in. “We knew immediately that changes would be required just to support the basic infrastructure of the facility and update it for this new application, as well as for future potential uses. Fiber instead of copper, an enhanced and an upgraded sound system that would support not only an FOH mix, but a live broadcast mix as well, and the ability to separately switch video and add graphics and audio to live stream the events to the web,” says Darrel Wenhardt, President & CEO of CBT Systems. “The facility needed a complete interior acoustical treatment, so we turned to Chips Davis of Chips David Designs and Shawn Mackie of STS Audio Consulting for the acoustical design and sound systems. Serving a JBL VTX PA system, CBT placed a 24-fader Lawo mc²36 console at FOH and a further 24-fader mc²36 console in the production control room, both connected and networked via RAVENNA to all the house audio I/O through a Lawo NOVA37 Router. The I/O includes four Lawo compact I/O stageboxes (offering 32 Mic/Line I/O, 8 AES I/O, 8 GPIO, 1 MADI ports) positioned around the venue and A__mic8 AES67 Audio-Over-IP interfacing. The entire facility design and rebuild took place over a five-month period, with Lawo personnel on site to support CBT Systems and Esports for commissioning and training. “It was critical that we get this right on the first pass and there were definitely some time constraints involved in meeting an accelerated schedule for deployment, once we opened we were open with no down-time in our event schedule,” says Esports Venue Manager Michael Buetsch. “We relied a lot on CBT’s experience with live production infrastructures to bridge the gap between what the facility already had, and what was needed to take event production to the next level for our new tenants. “The Lawo console is extremely open and configurable, and works flawlessly with the company’s audio router and stageboxes,” Mackie adds. 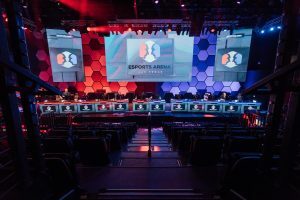 Since opening in March 2018, the arena has become a Mecca for amateur gamers, hosting record-breaking events with gaming personalities and arena-scale, high-stakes gaming competitions.